For over thirty years, Gary Sinise has stood as an advocate of America’s servicemen and women. It began in the early 80’s with his support of Vietnam Veterans groups and the creation of Vets Night, a program offering free dinners and performances to veterans at the Steppenwolf Theatre in Chicago. His commitment continued into the ’90’s working on behalf of the Disabled American Veterans organization which he continues to actively support. Since the attacks of September 11th, 2001, his dedication to our nation’s active duty defenders, veterans and first responders has become a tireless crusade of support, service and gratitude to all those who protect our freedom and serve our country. His portrayal of Lt. Dan Taylor in the landmark film “Forrest Gump” formed an enduring connection with servicemen and women throughout the military community. After several USO handshake tours in 2003, Sinise formed the “Lt. Dan Band” in early 2004 and began entertaining troops serving at home and abroad. The band now performs close to 50 shows a year for military bases, charities and fundraisers supporting wounded warriors, Gold Star families, veterans and troops around the world. Sinise serves as spokesperson for both the American Veterans Disabled for Life Memorial Foundation and Disabled American Veterans, and was instrumental in raising funds for the Pentagon Memorial in Washington, D.C. and The Brooklyn Wall of Remembrance in NYC. He serves on the board of Snowball Express, on executive councils for The Medal of Honor Foundation and the USO, and is an advisory board member for Hope for the Warriors. In recognition of his humanitarian work on behalf of our troops and veterans, Mr. Sinise has received many distinguished awards including The Bob Hope Award for Excellence in Entertainment from the Medal of Honor Society, the Spirit of the USO Award, The Ellis Island Medal of Honor, and in 2008 he was a recipient of the Presidential Citizens Medal, the second-highest civilian honor awarded to citizens for exemplary deeds performed in service of the nation, only the third actor ever to receive this honor. In 2012, Sinise was presented with the Spirit of Hope Award by the Department of Defense and was named an honorary Chief Petty Officer by the Navy. In 2011, to expand upon his individual efforts, Sinise established the Gary Sinise Foundation. Its mission is to serve and honor our nation’s defenders, veterans, first responders, their families and those in need by creating and supporting unique programs that entertain, educate, inspire, strengthen and build communities. Through its Building for America’s Bravest™ partnership, the Gary Sinise Foundation is building custom Smart Homes for severely wounded veterans. Additionally, the Foundation has created programs such as Dining with Defenders to serve hearty meals for deploying troops at LAX, Wounded Warrior, Family & Caregiver Appreciation Day Festivals to boost the morale and spirits of the patients, their families and the medical staff at military hospitals, and the Gary Sinise Foundation Emergency Relief Fund dedicated to assisting those in urgent need. It has also partnered with GE on GetSkillstoWork.org, a program designed to help veterans put their military experience to use in civilian jobs. 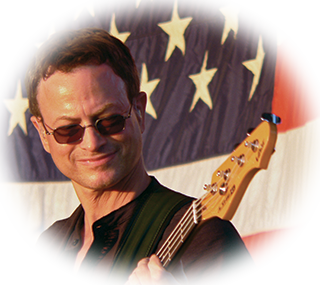 For a detailed history of concerts, appearances, and honors please visit the Founder page on the Gary Sinise Foundation website.